If you have spent any time using a business intelligence tool, you get the complaints about the traditional software. As a business person, there is this seemingly insurmountable barrier between the questions you have and the data you need to analyze to get your answers. It’s frustrating and ineffective. Valid questions often go unasked, and strategizing is forced to be reactive instead of proactive. Thankfully, a new breed of analytics solutions has been developed in recent years. These newer solutions are accessible, self-service, and have already had and will continue to have a massive impact on many business sectors. 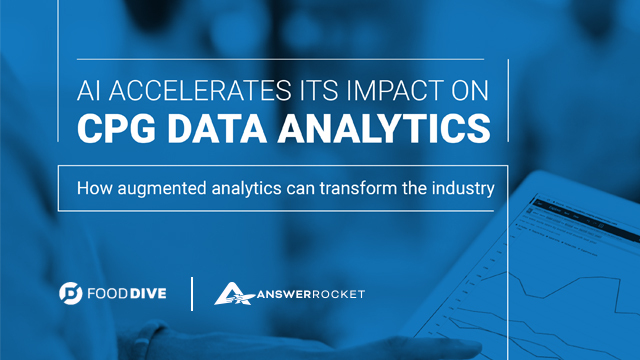 The CPG industry is no exception to this positive shift in the analytics space. Advances in AI analytics technology have made it possible to get meaningful answers faster than ever before. You can actually go from asking “what” questions to “why” and “how” questions. When users at consumer goods companies can perform sophisticated, automated analysis quickly, that versatility is a clear advantage over the competition. That’s why the folks over at Food Dive created a playbook all about how the CPG industry is using AI analytics to increase market share, grow revenue, and expand into new markets. How artificial intelligence fuels a “cycle of curiosity” that leads to more informed decision making. Why 72% of business leaders believe AI delivers a business advantage. How AI can quickly synthesize omnichannel data. How augmented analytics expands the tools available to analysts and data scientists. How marketing, insights, and sales leaders can foster more data-driven decision making. With this playbook, you’ll see why accessible, AI-powered analytics is revolutionizing the way CPGs leverage data. Download it now.